Available in Portable, Surface or Inground Mount. Dim: 72-1/8" Length x 22" Deep x 35" High. 109 Lbs. Seat and back are oven fused functionalized polyethylene copolymer-based thermoplastic. Seat and back is made with 11 gauge die formed angle frame 1" x 1-7/8" with 3" radius corners. Seat and back plates are fabricated from a 12ga plate. Holes are precision punched at 5/8" diameter. O7 gauge x 1-1/2" flat bar center support and mounting bracket understructure. Frame: 2-3/8" O.D. x 12 gauge pre-galvanized structural steel tubing with 4 powder coated finishes available. 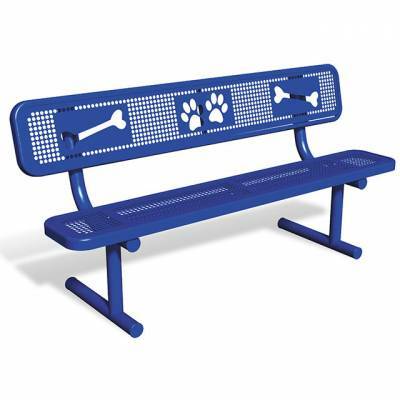 Our 6' Dog Park Bench feature laser cut dog themed detail to coordinate with your BarkPark play components. Our Dog Park Bench is thermoplastic coated for superior durability and beauty. 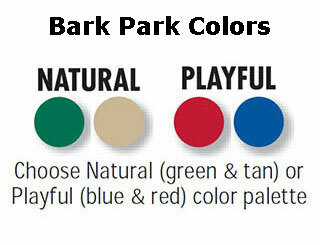 Choose from green and tan natural colors or blue and red for a playful look! 6' Deluxe Dog Park Bench, with Back – Portable.